Product Destruction through Magnetic Degaussing. We do Product Destruction through Magnetic Degaussing. At California Electronics Recycler we can destroy product data using our degaussing machines to making your it unreadable and untraceable by even the most advanced devices. Our Hard Drive, Tapes, Memory and Media Degaussing technique is compliant for all digital media destruction. Your product data is destroyed and irrecoverable… PERIOD! Degaussing is a secure way to permanently destroy data left on your digital storage devices. Whether you are decommissioning or dealing with defective products it is important to eliminate all memory from digital storage device. Most data storage devices use a form of magnetic media, creating very small areas called magnetic domains. Degaussing eliminates and destroys the magnetic field position causing the magnetic domains to be left in random patterns, making the data unreadable and unrecoverable. It is possible electronic components and circuit boards can be destroyed by a degausser and render them no longer usable. We would then responsibly recycle your products where they may be made into new products. 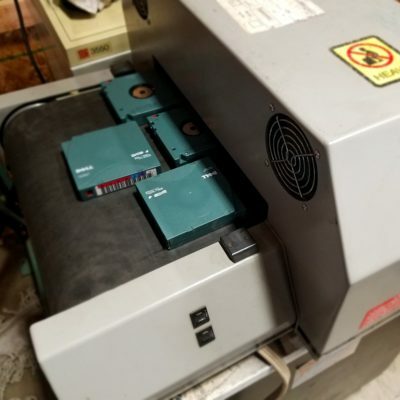 If you desire to have your products with data storage sent through our degaussing machine, you may call us for a Pickup or you can come drop-off your them off at our location in the city of Santa Ana, California. We can help you degauss your products using one of our safe and secure degaussing machines. When is it Necessary to Use a Degausser? When high profile products with data such as government computers and records need to be destroyed there is an added measure to ensure the data is completely irrecoverable. Degaussing of products with storage media uses a powerful magnetic to destroy and corrupt the data making the media unusable. After the products are degaussed we may also destroy the device by means of our 4 ton hydraulic press or shredder. To ensure maximum security and destruction of data it is highly recommended that products utilizing memory are degaussed prior to physical destruction. At California Electronics Recycler we use professional degaussing machines that destroy product data quickly and efficiently. After sending your electronic products through our degausser we test them to make sure the data is irretrievable and destroyed. Depending on the level of destruction required we can physically destroy your products with our 4 ton hydraulic press for maximum security and protection. Call us today at (800) 282-3927 or email us at info@carecycler.com to receive a service quote or learn about our FREE Data Destruction option.